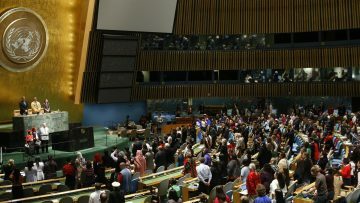 The Indigenous Peoples in Development Branch/Secretariat of the Permanent Forum on Indigenous Issues (IPDB/SPFII) was established by the General Assembly in 2002. It is based at United Nations Headquarters in New York in the Division for Inclusive Social Development (DISD) of the Department of Economic and Social Affairs (DESA). The functions of the secretariat are designated in the General Assembly resolution 57/197. Its central function is to provide substantive assistance and support to the Forum in carrying out its mandate. IPDB/SPFII is also the substantive unit for Indigenous Issues at the United Nations Headquarters. As such it provides support for inter-governmental processes and bodies related to Indigenous Issues. It is also the co-chair of the UN Inter-Agency support group on Indigenous Peoples Rights.